Combining Hispanic and Southern flavors is the goal with my BBQ Tostadas. Very easy, delicious and perfecto for Cinco de Mayo! 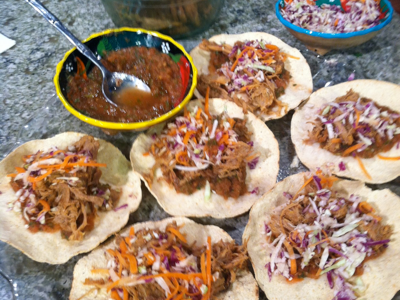 Place blender salsa on top of your tostada, then add the shredded barbecue, slaw and more salsa. Repeat for each tostada and enjoy! We can't always smoke our own barbecue, but even busy days call for non-drive thru meals. Let this be your great, crock-pot family barbecue recipe. (If your pork is extra-fatty, trim off some of the excess fat). Take all of the dry seasoning and combine, then rub all over the pork, massaging the pork with the dry rub. Pour the bottle of beer into the crock pot, then add the quartered onion. Next add the pork. If your pork is too large to fit into your crock pot, just cut it in half, and stack in the crock pot. Cook on low for 8 to 10 hours. Remove the pork to a large bowl, and shred. Pour liquid into a small pot and cook on medium high heat, to reduce the liquid. After shredding the pork, place the pork back in the crock pot, and then add your "cooked liquid" (if desired) and barbecue sauce. Remove half of the pork to use for Mexican dishes, before adding the barbecue sauce. Put the cabbage, carrots and red cabbage through the food processor and then mix together in a bowl. Store in an air-tight container or a freezer bag. Top BBQ Tostadas with the colorful mixture. To make the World Famous Cole Slaw, just add mayonnaise until it is the "wet" consistency that you desire.